We looked at David’s relationship with God (“the Lord is with Him”). Today, let’s consider two points. Before David was king he was known as a mighty man of valor and a warrior. I offer the combo descriptor “man of war”. David is a great example of the popular phrase “leaders are born, not made”. His life also supports the preaching and teaching many of us receive from pastors and others — that all we need to complete our divine assignment is in us. The above listed qualities certainly belong to a king…but first tested on a king. David was ready yet not proven…as is the case with many of our real-life Davids. Let’s take a closer look at these descriptors. Wow, right?! Built in to David’s personal psychology is strength, bravery, ability, honor, wealth (resource), efficiency and a force. (Do you see now why it’s difficult to help them? They don’t think they need it!) David alone is a force…and this is part of what makes him great in battle. But more than this, David is a champion of battle (see 1 Samuel 18:7). Furthermore, David is a servant to battle. This is HUGE to understanding the Davids in our lives because their fierceness and independence and self-sufficiency can lead us to two major wrong conclusions. #1: DAVID DEPENDS ON SELF MORE THAN GOD. Many of us receive training and teaching on how to be a certain kind of godly wife. We read books and articles. Of course, we compare notes and have HOURS of discussions. We consult scripture and keep projecting the Proverbs 31 ideal on the wall. Try as we might though, we squeeze into and out of molds not made for us. And it takes some extensive undoing of our conditioning to be “a helpmate suitable” for David. When we digest David’s reality as a man of war, then we can see our appeal as the “place” of peace. It sounds romantic, but it’s really tragic…because you and I have to surrender the need and sometimes right to bring the fight to David. I know we believe the Word that we are more than conquerors, but we are no match for a man who alone is a force for battle, who is a servant to battle, who is intimate with warring ways (don’t miss that!). We have to make peace with the man David. That’s tough because our conditioning only strengthened our spiritual eyes. The result is fuzzy vision in the natural and an inability to read and understand him. Ouch, I know. It is easier to point to what he needs to do and how he needs to seek God or be bold or __________________ (fill in the blank with the complaint you bring to God). Instead, let’s create a new habit of/in faith; let’s believe that as he stands now, God anointed and called him. Let’s step back and LEARN BATTLE-TESTED FAITH from David. #2: DAVID IS JUST LIKE NABAL. Because of his almost animalistic approach to warfare (beast-mode, in-your-face, fearless, kill or be killed, survival of the fittest), we can misread his way for Nabal’s folly and his outside target (“them“) for inside (“us“). David is like a war machine. He’s the go-to guy for battle. But he is not stingy or evil hearted or wicked like Nabal. He does not ignore human need and feeling, like Nabal. David is nothing like Nabal. The latter is an animal, while the former can resort to animalistic tactics in battle. David is constantly thinking of home and family, and considers that the battle he fights now reduces the future battles for succeeding generations. We know this from the story of David’s life; Solomon reigned by wisdom, not blood. And Absalom, sadly, proved that war out of season cuts off destiny. My dear Abigail sister-friends, I don’t know why God chose us for David. But we cannot deny our admiration for their bravery, nor the deep love for their willingness to defend and rescue us. We adore David because he is a real man, but we shrink back at the trade-offs (communication issues, distraction issues, the hunt-her-capture-her mentality) that cause us to feel unloved or neglected or ignored. Look at the picture above again. 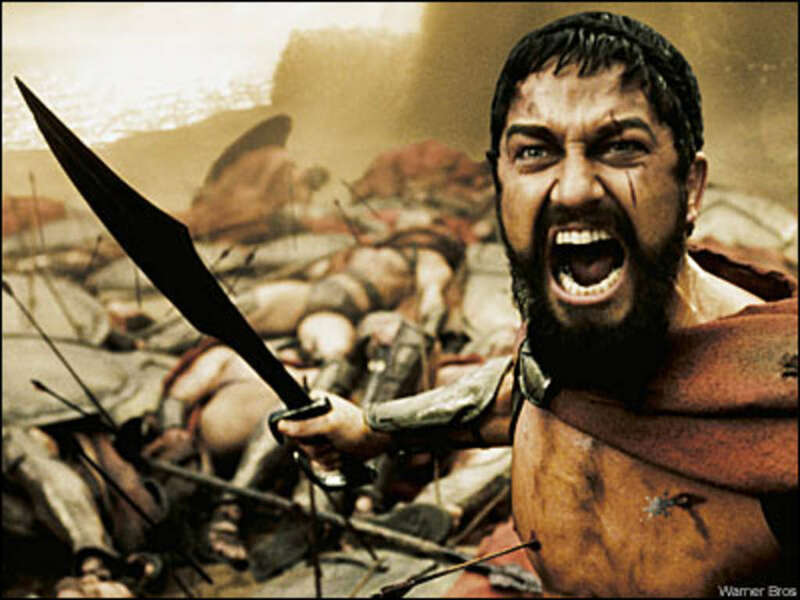 This is Leonidas from the movie 300 (one of my favorites of all time). While we live in a very real world, this character gives me hope because he and his wife the queen had a great understanding. She knew she married a warrior, and that her son inherited that champion’s heart. When away she held things down for her king. But when he returned, he was with her in every way that left her absolutely secure in him, in their love, and in his duty to defeat every enemy of Sparta. Watch it if you haven’t, and if you have, watch it again with David in mind as a man of war. Abigail, we will be just fine. Selah, and love to all. Wow my sister…thanks for helping a married sister out! !